There are many ways to built on ‘duration’ in behaviours you train with positive reinforcement. I will give an example of building duration in stationary behaviours and building duration in moving behaviours. In clicker training there is a saying You get what you reinforce. In practise it is often quite hard to recognize what behaviour you are actually marking with your click. Only after a while -when you get a certain amount of the reinforced (marked) behaviour- it shows what you’ve been clicking for, according to the horse. If that was not what you intended, you have to change your timing. If you have difficulties training for duration or other criteria ask yourself: What am I clicking for? A video will help you discover it. With stationary behaviours I mean behaviours when the horse is not suppose to move. Examples are: Key Lesson Patience, Key Lesson Mat Training, Key Lesson Head lowering. Building duration in stationary behaviours can be done with increasing your Rate of Reinforcement (RoR): as long as your horse displays the desired behaviour you keep clicking and reinforcing. When the horse moves out of the desired position you stop clicking and reinforcing. The click must be timed when the horse does not move. Example 1: when your horse is standing on a mat and it is difficult to built duration, are you really reinforcing ‘standing on the mat’? Describe your criteria and focus on what you want. Standing on a mat: hoof or hooves are touching the mat, horse has weight on his foot/feet. If your timing is not correct, you might have clicked more often for ‘moving towards the mat’ or ‘moving away from the mat’ than ‘touching the mat’. Both movement behaviours are present in pawing. If your horse paws the mat, are you really only clicking for the moment he touches the mat or is your horse already moving his leg and are you actually reinforcing the movement of the leg? If that is too difficult to time, start focusing on another criterion: ‘putting weight on the hoof that touches the mat’. This is an example of the horse doesn’t yet understand the assignment. You need to teach him first to really stand on the mat (not just touching briefly) before adding duration to the exercise. Example 2: as long as your horse stands ‘Patiently’ waiting next to you, you click, give a treat and when he hasn’t moved, you click and reinforce again. You keep doing this until your horse decides to try out another behaviour, eg moving forward one step and you stop clicking. Once he offers the desired behaviour again you start clicking and reinforcing. Most horses will learn quickly that ‘not doing anything (else)‘ is very rewarding. When your horse offers the desired behaviour, wait 1 second (counting out loud can help you and your horse) then click and reinforce. Then you count to 2 before clicking and reinforcing. Don’t train this in a lineair way and go from 1, 2, 3, 4 to 5 seconds. Instead, alternate the duration and go from 1 second before you click to 0 seconds (click right away), to 1 and then 2 seconds before you click. Then do 1 second, click, 2 seconds, click, 1 second, click, 2 seconds, 3 seconds click, 1 second, click 4 seconds, click and so on. You horse learns that as long as you are still counting he must do whatever he is doing. If he moves before you can count to 2, you start counting from 1 again. If you already have an established ‘keep-going’ signal, you can use that instead of counting out loud. With building duration in movement I mean the behaviours when the horse is is suppose to keep moving. Example: Key Lesson Backing. The click must be timed when the horse does move. Make sure you click and reinforce the movement itself and not after the movement stopped or before the movement is happening. Example: in Key Lesson Backing you want to focus on the movement. You start clicking for weight shift while that movement is going on. Then of one step with one hoof, one with two hoofs and so on. Once your horse understands the behaviour, you can build duration by clicking for the movement only. Please remember that click means also ‘end of behaviour’. So when the horse stops after hearing the click that is OK. He was moving when the click was happening. The click marks the behaviour. Once your horse has learned to keep moving, you need a cue to ask him to stop, because you won’t always keep clicking to break the pattern of movement. You can ask for a incompatible behaviour in order to stop the movement you’ve been training. Don’t forget to reinforce that behaviour, too! In backing you can ask for ‘halt’ (cue ‘Whoa’) or ‘go forward’ ( cue ‘Walk on’). There are many more ways you can built duration in a behaviour. What works for you depends on the animal, the situation and on your level of expertise. This blog has no room to share all possibilities, I usually keep the word count around 500 and this one is already more than twice as long. If you want to share your approach or training tips about building duration add them in the comments for everyone else to read. If you think this is a blog that someone can benefit from or if you want to share this on your social media, use one of the share buttons below. I also love to hear your view on this subject, so please add a comment. I read them all! I help horse owners create the relationship with their horse and get the training result they really, really want. Positive reinforcement training is all about giving a reward to reinforce the behaviour you want more of. The key word is giving. If you have never used a bridge signal before, you start with the simple act of giving. In return you will get your horses’ attention. Then ‘training’ can begin. When you introduce the clicker or another bridge signal to your horse, you start with just clicking and giving rewards. No strings attached. After 30 – 50 repetitions (often sooner) of click = reward, the horse will try to figure out what made you give the treat and if he can influence this by his behaviour. In other words: he will start trying different behaviours in order earn a treat. He is ‘asking’ you what you want from him! 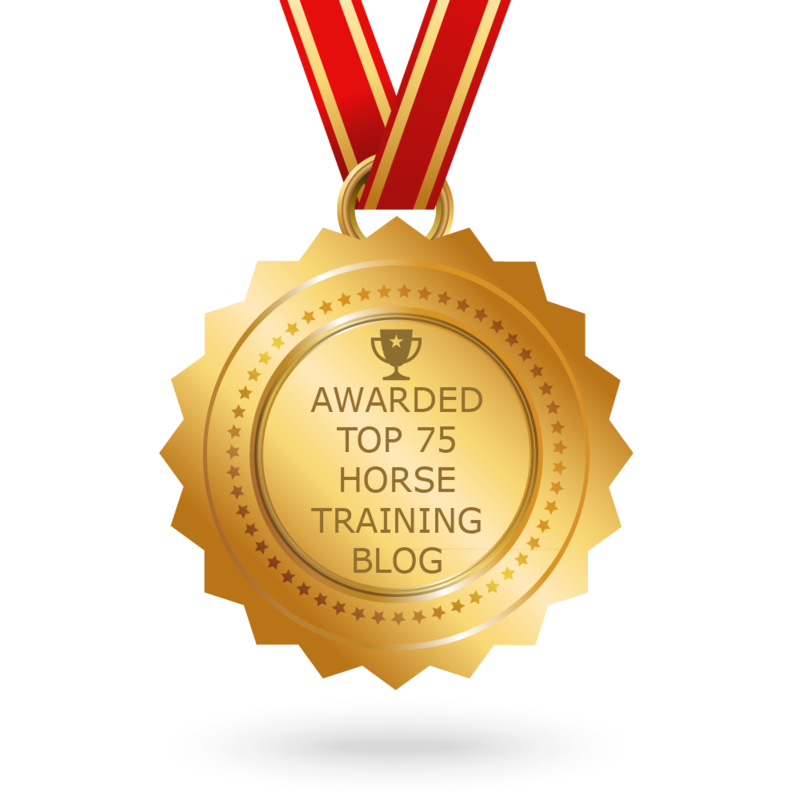 You will notice that it is very easy to teach your horse new behaviours and within a few clicks he is offering you his new trick more and more consistently. Let’s take targeting as an example. You want to teach your horse to touch the target stick with his nose on cue. 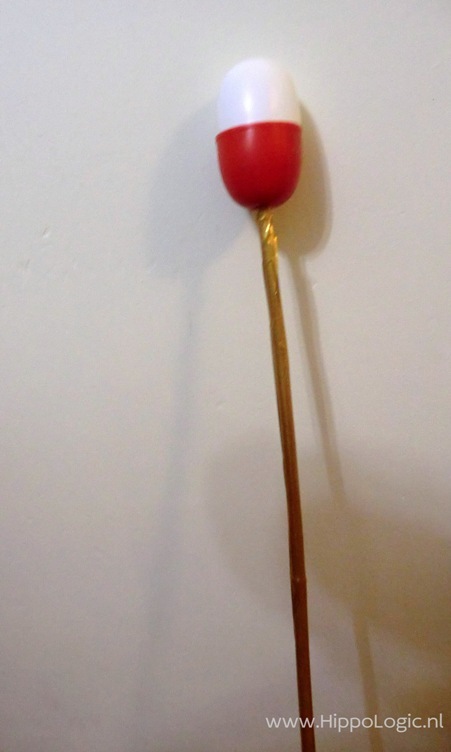 You start with presenting the target stick (a stick with a ball attached on the end) to your horse. In the beginning your criteria are low: it doesn’t matter where he touches the target stick as long as he touches it. If you want to set it up for success, you make the desired behaviour (touching the target stick near the target & touching the target itself) much easier than the less desired behaviour (touching the stick near your hand or touching your hand). So that’s why you start by working with a barrier in the beginning. Once your horse is offering a certain behaviour consistently you can add a cue. 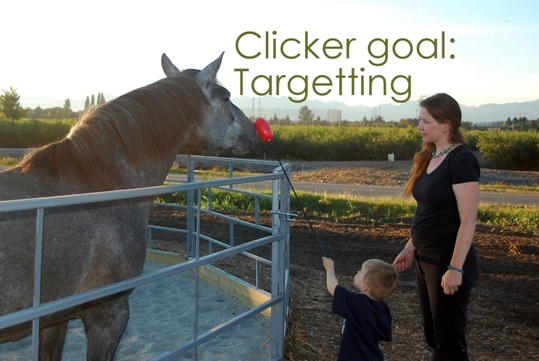 In this example: your horse is touching the target predictably and he knows that touching the stick isn’t getting him rewards. You might have worked with a training cue , e.g. presenting the target stick to your horse is a cue in itself. The horse might have associated specific conditions and consider them as cues we are not even aware of. Maybe you are always in the same place (stall, with a barrier) or at the same time of day when you were working with the target stick. Sometimes this temporary cue (presenting the target) is not a very useful cue in other circumstances and then it its time to introduce your ‘official cue’. You don’t want your horse to touch the target stick all the time… It would be rather annoying if he puts his nose to the target whenever he sees the stick. Your horse can become very frustrated if you click offered behaviour sometimes, but would click it every time. That’s why you need a cue. The cue means ‘you can start earning rewards now’. So if your horse is offering to touch the target consistently it is time to introduce an ‘official (final) cue’ e.g. the verbal cue ‘Touch’. You start by using the new cue before the ‘training (temporary) cue’. Horses will quickly anticipate this and when he starts acting on the official cue you capture his behaviour with a click. After some repetitions where you can click & reward after the behaviour occurred after you have given the new cue you can raise your criterion. Now you only click & reinforce when you have given your final cue for the behaviour. If your horse acts on the temporary cue or offers the behaviour spontaneously you don’t reinforce it. This is the final step in training a behaviour. You might notice, because you changed the criteria and he doesn’t get reinforced so easily, that your horse will try harder to make you click & reinforce. You might see a duration in touching the target or something else you want to reinforce. Ignore this. It is important to be consequent: final cue + behaviour= click and reinforce, spontaneously offered behaviour does’t lead to a click anymore in this stage of training. If he tries really hard and you see improvement in the behaviour take advantage and simply give your horse a chance to earn a click by offering the new cue to him. He will learn to pay more attention and figure out quickly when he can and when he can’t expect a reinforcer. The final step in the process of teaching a behaviour is to use the new cue in different circumstances. If your horse performs well in different situations, he has generalized the cue. Well done! Changing context: now Leon is holding the target stick and giving the command. A horse learns a certain behaviour in a certain context. Therefor it’s best to start training new exercises always in the same spot, for instance the round pen where you have the advantage of working with protective contact (a barrier). If you want to test your new cue you have to shift one or more of the conditions (the context) your horse was learning a specific behaviour in. Now you ask to touch the target without a barrier between you two, or you ask it in the outdoor arena instead of the roundpen or at a different time of day and so on. This will ask the horse to adjust and generalize and ignore certain ‘cues’ in the context and pay more attention to others, your new cue. Sometimes a horse seems to lose all his skills in a new context because the cues he had paid attention to are not there anymore. Always lower your criteria temporarily if you change the context of learning, so your horse will gets his confidence back quickly. Would you like a personal online clicker consult or a video coaching session, canter to my website to find out more.